Sen. John McCain poses at the Republic Media building. 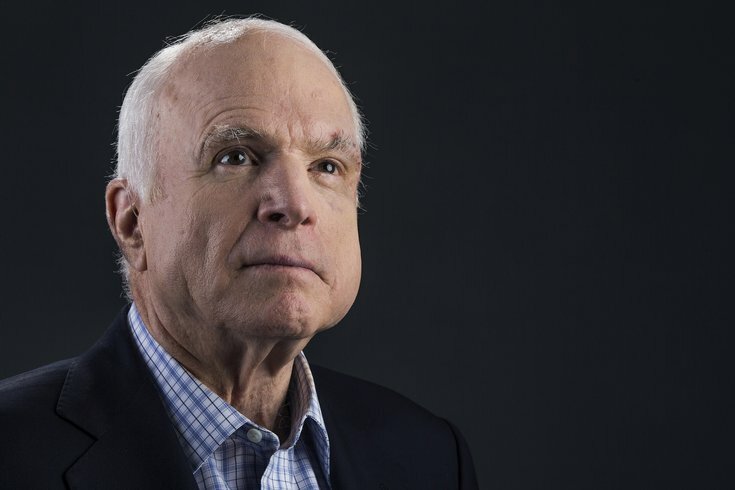 After more than a year-long battle with brain cancer, U.S. Sen. John McCain, 81, died on Aug. 25 at his ranch near Sedona, Arizona. His family announced last week that he was discontinuing medical treatment. McCain was a naval bomber pilot who earned the respect of Republicans and Democrats alike during his 40-year career in Washington and during his two unsuccessful campaigns for president. He was the son and grandson of four-star admirals and a prisoner of war in Vietnam. As a young officer, he was imprisoned for five years and tortured. Many lauded McCain as a hero who walked among us. "My heart is broken," McCain's wife, Cindy, wrote in a tweet on Saturday. "I am so lucky to have lived the adventure of loving this incredible man for 38 years. He passed the way he lived, on his own terms, surrounded by the people he loved, in the place he loved best." "All that I am is thanks to him," his daughter, Meghan McCain, who has taken up her own interest in politics and been an outspoken voice in the GOP, put in a heartfelt statement on Twitter. "Now that he is gone, the task of my lifetime is to live up to his example, his expectations, and his love." McCain published a memoir in May called "The Restless Wave," after he left the Senate in December due to his declining health. "It's been quite a ride. I've known great passions, seen amazing wonders, fought in a war, and helped make peace," he wrote. "I've lived very well and I've been deprived of all comforts. I've been as lonely as a person can be and I've enjoyed the company of heroes. I've suffered the deepest despair and experienced the highest exultation. I made a small place for myself in the story of America and the history of my times." McCain has been an outspoken critic of President Donald Trump — calling his meeting with the Russian president in July "one of the most disgraceful performances by an American president in memory." An individual close to the McCain family confirmed that Trump would not be invited to the funeral, CNN reported. Former presidents George W. Bush and Barack Obama will reportedly give eulogies at the funeral.